Note: Reporter John Fuller was assigned to write a piece originally called "Outer Space Ghost Story" for LOOK Magazine. Also, LOOK magazine dated Feb 22, 1966, edition, pages 36-42 carried the Exeter account. It appeared in Reader's Digest and then in True Magazine as "The Incident at Exeter" - the title Fuller used for his book. Peter R. Geremia, director of the New Hampshire chapter of MUFON (Mutual UFO Network) remembers Fuller as a scrupulous investigative reporter. Geremia has studied Fuller's notes now archived at Boston University and describes his work as "very, very meticulous." 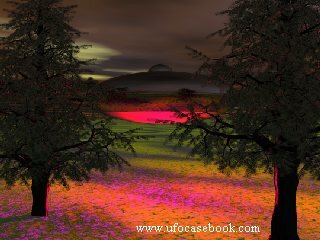 In 1965, in the city of Exeter, New Hampshire, a series of UFO sightings took place which gained vast media attention, and became the subject of the book, "Incident at Exeter," by John G. Fuller. The sensational happenings were also featured in a two-part article in "Look" magazine. The remarkable chain of events in New Hampshire began with a man named Norman Muscarello, who was hitchhiking back to his house in Exeter on Route 150. At the time, Exeter was a small New England town of about 7,000 people. In the wee hours of the night on a cold, September 3, 1965, eighteen-year-old Muscarello made his trek. It was about 2:00 AM that this lonely hitchhiker first noticed an unusual light in the dark skies. The light became an object, which suddenly came from the sky towards the young man. The object was described as approximately 90 feet in diameter, with bright, beaming lights that appeared around its rim. Silently, the object began to wobble and float toward the frightened man. His fear of actually being hit caused him to fall to the ground by the side of the road. At the last moment, the object floated away from him. Muscarello took this opportunity to jump up and run to a nearby house, pounding on the front door. The house was the home of Carl Dining. No one answered his frantic pleas for help. Meanwhile, at the Exeter Police Station, Officer Eugene Bertrand received a call from a frightened woman who stated that a large, silent object with flashing lights had followed her car for twelve miles from the city of Epping to a spot on the road where she pulled off in fear. After she stopped her automobile, the strange object had disappeared into the night. Bertrand did not make an official report on the woman's call, believing it to be untrue or a trick. Meanwhile, Muscarello, not finding anyone at the farmhouse, ran back into the road, and flagged down a passing car. A middle-aged couple stopped to render aid. They drove the weary traveler to the Exeter Police Station. Muscarello, full of excitement, began to recount the events of the last hour on Route 150. B J's Note: Muscarello would later relate that the male driver of the car was never identified in Fuller's book because the woman with him at 2:00 AM wasn't hia wife. The desk Officer, Reginald "Scratch" Toland, is now convinced that something has happened, and radios to Officer Bertrand, who is now on patrol. At about 3:00 AM, Bertrand arrives at the station, and after hearing Muscarello's story, thinks he may have discounted the earlier call from the woman too quickly. 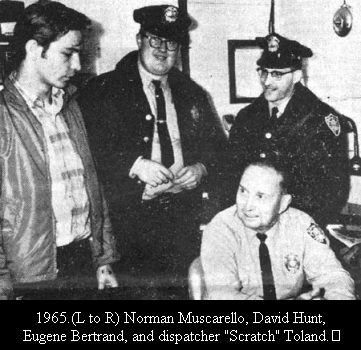 Convinced that Muscarello's story is real, Officer Bertrand takes Muscarello back to the spot on Route 150 where the incident began. At this point, Bertrand has no idea what lies ahead of him this night. Arriving at the scene, the two men scan the area, and at first see nothing out of the ordinary. By the road, there is a large open field, the house that Muscarello had visited, and a horse corral. They begin to walk out into the open field in the direction of the horse corral. The horses seemed to be a little edgy, and suddenly dogs began to bark. From behind two pine trees, an object begins to rise, lighting the whole area with a reddish hue. Muscarello screams, "I see it! I see it!" The next moment, Bertrand says, "My God, I see the damn thing myself!" It is important to note that Bertrand had been in the Air Force for four years, and knew military aircraft. He would later insist "this wasn't like anything I had seen before." Like a leaf floating, the object slowly moved toward the two men. They scurried back to the police car. The object is now hovering about one hundred feet above the ground, some fifty yards from the police car. "Norman and I came out here and I parked right about where we are parked right now. We sat looking for several minutes but didn't see anything unusual. I radioed the station and told them that there was nothing out here. They asked me to take a walk into the field for a quick look before coming back in. I felt kind of foolish walking out here on private property after midnight, looking for a flying saucer!" Bertrand then suggested that we go out to the field so that he could show me where he and Norman had been. We got out of the car and strolled into the field toward a corral. "We walked out about this far," he said "I waved my flashlight back and forth, and then Norman shouted, 'Look out, here it comes!' I swung around and could hardly believe what I was seeing. There was this huge, dark object as big as that barn over there with red flashing lights on it. It barely cleared that tree right there, and it was moving back and forth." "What did you guys do when you saw that thing?" I asked. "Well, it seemed to tilt and come right at us. Norman told me later that I was yelling, 'I'll shoot it! I'll shoot it!' I did automatically drop on one knee and drew my service revolver, but I didn't shoot. I do remember suddenly thinking that it would be unwise to fire at it, so I yelled to Norman to run for the cruiser, but he just froze in his tracks. I practically had to drag him back!" "How close was the object to you then?" I asked. "It seemed to be about one hundred feet up and about one hundred feet away. All I could see at that point was bright red with sort of a halo effect. I thought we'd be burned alive, but it gave off no heat and I didn't hear any noise. I called Dave Hunt on the radio. He was already on his way out here, and arrived in just a few minutes. Whatever it was, it must have really scared the horses in that barn." "Why do you say that? Did you hear them from here?" I asked. "Yeh, you could hear them neighing and kicking in their stalls. Even the dogs around here started howling. When Dave arrived, the three of us just stood there and watched it. It floated, wobbled, and did things that no plane could do. Then it just darted away over those trees toward Hampton." "What did you do then?" I asked. "Well, we all returned to the station to write up our report. We'd only been back a short while when a call came in from the Hampton telephone operator. She told us that she'd just talked to a man who was calling from a phone booth and was very upset. He said that he was being chased by a flying saucer and that it was still out there! Before she could connect him with us, the connection was broken. We went out looking for him and even went to the hospital to see if he'd been brought in there, but we never found out who he was." The object's light is so intense, that it is difficult to make out its shape. The lights emanating from the craft dim and then brighten, from left to right, and then right to left. The object now begins to slowly move away from the men, in the direction of the city of Hampton. At this very moment, another Policeman, David Hunt, arrives at the scene to witness the craft in the sky, as it fades out of sight. In a matter of minutes, the craft is sighted in Hampton, and a report made to Pease Air Force Base. Mrs. Virginia Hale, a reporter for the Haverhill Gazette, also sees the unknown craft from her kitchen window as it hovers over a neighbor's house for about 4 minutes. There were many other reported sightings of a similarly described craft over the next several weeks, but it is uncertain if they were all legitimate or not. Based on additional information submitted to our UFO Investigation Officer, Wright-Patterson AFB, Ohio, we have been unable to identify the object that you observed on September 3, 1965. In nineteen years of investigating over ten thousand reports of unidentified flying objects, the evidence has proved almost conclusively that reported aerial phenomena have been either objects created or set aloft by men, generated by atmospheric conditions, or caused by celestial bodies or the residue of meteoric activity. Thank you for reporting your observation to the Air Force, and for your subsequent co-operation concerning the report. I regret any inconvenience you may have suffered as a result. The events at Exeter, New Hampshire were so compelling, that the case was featured in the April 5, 1966, Congressional hearing that led to the Condon investigation. The involvement of two police officers gave it an official stamp that made it a bit harder than usual to dismiss. Attempts to explain it by invoking twinkling stars and planets, advertising planes, or military operations were difficult to jive with the descriptions given. Fuller insisted this constituted "convincing evidence" that UFOs were real and extraterrestrial.